Recently I had a mail from a former colleague from way back in the day. He is high up in sales for a radio group. I asked him who did his creative and he told me they use external production houses…. “It’s MUCH cheaper” he told me. Mmmm. Lets look at that. A few years ago I was working as a freelancer at a radio station and we went out to see a client. We took a brief. Nothing different to what you may have to do with an external production house. The sales person kind of expected that the client would buy one ad to run on her station for a month. But we took more briefs, wrote around a dozen ads, and presented them to the client. We developed the relationship with that client, honed and worked on the creative and then they dropped the bombshell. They loved them so much wanted to run all the ads, in all the areas where they were launching their product. Suddenly an order that was maybe ten thousand pounds because hundreds of thousands. Creative and Sales working together can get clients to spend that would not have done so, it increases spend… it MORE than justifies having a Creative on the team…. if IF you do it right. IF you don’t see a writer as just a factory to make ads. In 2 visits I justified the salary of a Creative for the next 20 years. One Creative Consultant I know went into a radio station and worked out that every year the Creative Team added around a million pounds to the station that they would not have written without the onsite writers. I’m not sure HOW he worked it out, but I can believe it. The UKRD Group has caught on to this and have employed Mike Bersin, putting site writers into their radio stations. Writers who can write multiple ad campaigns, who can present creative with confidence, and who have a wealth or radio experience. There are some big names and people who I hugely respect working at some UKRD stations now. I wish them well with it. They deserve to do big things. As for production houses, there’s still a need for them. Healthy competition is a good thing. Agencies have choice, clients have choice and smaller stations that cant afford a production facility have an option. But if you want to see growth in sales, get a writer! How many writers? Good question. Wouldn’t it be interesting if every sales person had a dedicated creative? I can only dream. For more on Mike Bersin and his methods for increased Radio Station revenues, read these books! Make More Money: A Business Users Guide to Creating Radio Ads That Increase Sales, Turnover and Profit. 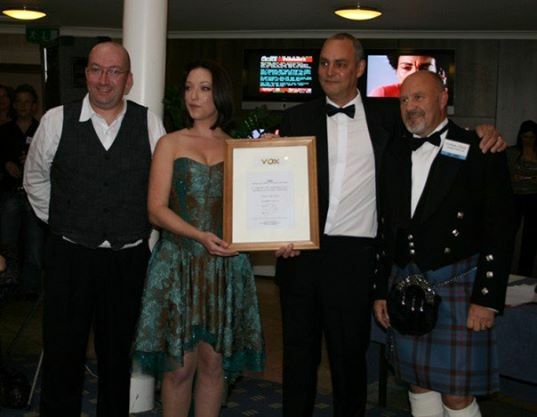 L to R Simon Rushton, Emily Morris, Mike Bersin and Graham Elliott.